Gone Reading is, without a doubt, my favorite on-line store for book-related products! About a year and a half ago, I featured Gone Reading and reviewed a few of their products -- an adorable tee-shirt and a book-shaped platter! Gone Reading has the best gift ideas for book lovers. Even their slogan is fantastic, "Brilliant Products for the Reading Lifestyle." I couldn't agree more. Every time I visit their site, I find something new that I want/need. They sell action-figures, stationery, book lights, serving pieces, drink ware, and even candles! I don't mean this in a negative way at all, but I get a bit overwhelmed when I visit the site. I'm like a kid in a candy store (or a book lover in a book store) because there are so many items that I want! If you haven't been to Gone Reading for awhile, you might want to check it out again. Or, if you've never been there, then you definitely should visit. Gone Reading has some wonderful new items. I was fortunate enough to receive samples of a few of them. Summary: Mark your books as your own with this cute set of 80 decorated book labels in assorted sizes. 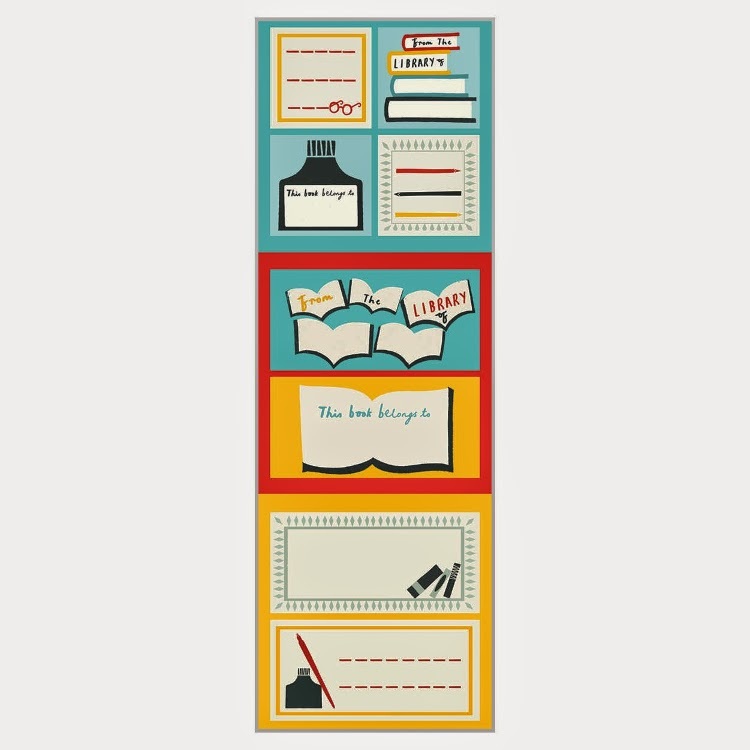 The original artwork by artist Debbie Powell includes a variety of library, writing and reading-themed designs you’re sure to love. Each page measures 4″ x 3-3/4″; the assorted sizes include full, 1/2 and 1/4 page sized bookplates. 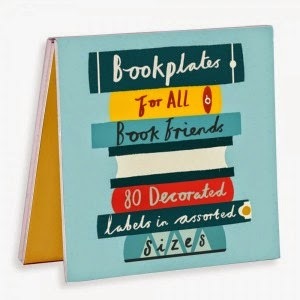 Perfect for gifting to your own “book friends”! Summary: Where fun meets function! 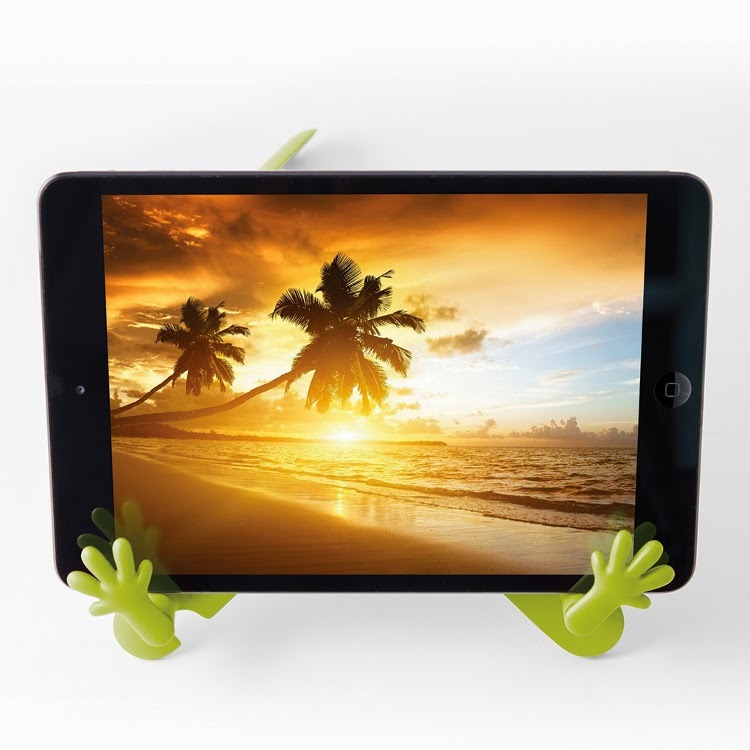 This cute device gently “holds and hugs” your books, tablets and eReaders in place, freeing up your hands while reading. Holds a wide variety of books and devices, yet small enough to fold up into a small bag or purse. Perfect for use on airplane/train meal trays, tables, kitchen counters or most any flat surface. 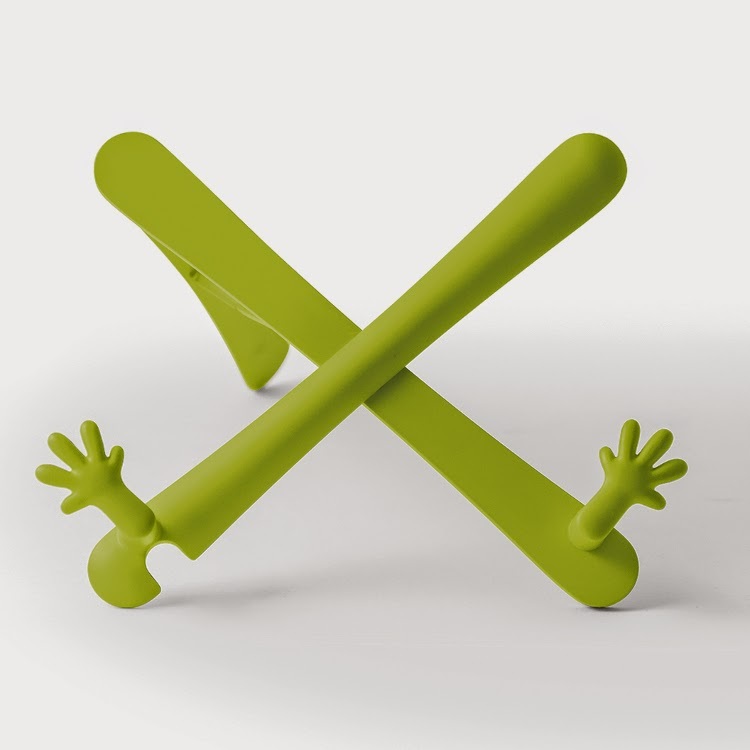 Another totally fun item sold by Gone Reading is The Hands Stand. I have to say that this is actually a very practical item, and I love how useful it is for holding my iPad... or my cookbooks. Even better, it makes me smile every time I use it! It just looks like it's "hugging" my device! I think The Hands Stand is the perfect gift! It is very reasonable at $19.99 especially considering how happy it will make the recipient! One of the best things about The Hands Stand is that it folds up so it can easily fit into a purse, backpack, or briefcase. For those of you interested in the "specs": each Hands Stand measures 8-1/2″ long when closed. It can accommodate books, tablets and eReaders that are at least 6″ wide (the distance between each “hand” when fully open is 5-1/2″) and a maximum of about 3/4″ thick (the width of the “shelf” on which the book or device rests). Summary: Express your love of free speech with a hot beverage served in your very own Banned Books Mug. Features original artwork, imagery and titles of 24 of the most important banned books of all time. Includes The Satanic Verses, Ulysses, Catch-22, Nineteen Eighty-four, Animal Farm, Uncle Tom’s Cabin, Madame Bovary, Les Miserables, Lady Chatterly’s Lover and so many more. A sturdy, high-quality mug that will last a lifetime. Microwave and dishwasher safe. Arrives in its own colorful gift box. My absolute favorite item is the Banned Books Mug which sells for $12.95. This mug is so cool! 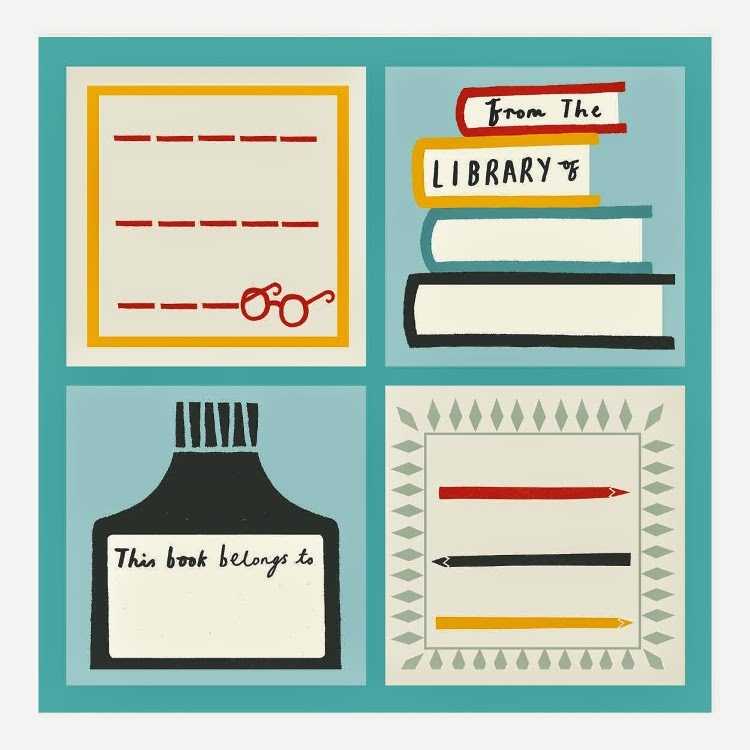 Not only does it list 24 important banned books including some of my faves like TO KILL A MOCKINGBIRD, ADVENTURES OF HUCKLEBERRY FINN, and THE CATHER IN THE RYE, it's also really stylish. The mug comes in a box which looks just like the mug so it's perfect for gift-giving. The mug itself is a faded black with the 24 books listed in different fonts and different colors. You can't tell this from the photo unless you look very closely, but the word "BANNED" is printed in a raised black font. 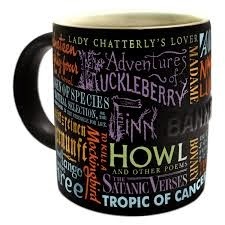 It's just a special mug and a way to celebrate these great works of literature. The Banned Books mug holds 12 ounces of liquid and is microwave and dishwasher safe too. I don't know about you, but those are must-haves in my house! Gone Reading's website is very user-friendly which makes it even easier to shop for the book lover in your life -- even if that book lover is you. You can shop by product type, by theme, by author, bestsellers or by new products. There is even a clearance section for you fans of bargains. Shipping is free for orders over $90. Make sure you join their e-mail list to get the latest on specials and new products. You will also receive a 10% off coupon for signing up! Finally, here's one of my favorite things about Gone Reading. The folks at Gone Reading donate 100% of their after-tax profits to reading-related charities like READ Global, Ethiopia Reads and BiblioWorks! So when you buy from Gone Reading, you are actually helping others too! What a great concept! I love Gone Reading too. They have such great products and support such important causes.